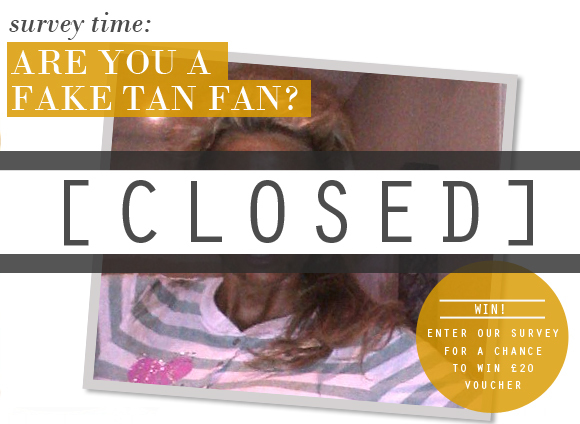 Survey – Are you a fake tan fan? Katie Price was seen this week looking rather mahogany, after a tan-disaster while using mate Lauren Goodger new tanning range . So we’d like to get your thoughts on fake tanning and just how dark you’d go. Share your opinion with us in our flash survey below, and be in with a chance to win a £20 Escentual voucher – to spend on fake tan, sun protection, or maybe just some bronzer! So give us your thoughts, and good luck. Entries close at midnight on Wednesday 11th July. Only one entry per person (based on IP address) will be counted. Automated entries will be disqualified from the prize draw. Entries will close at 11.59pm on the 11th July, and prize winners will be notified the following day. One winnes will be picked at random. Escentual reserves the right to withdraw any nominations or votes if they feel they are abusing the competition or any of its rules. General Terms & Conditions apply. This entry was posted on Friday, July 6th, 2012 at 5:29 pm and is filed under Competitions, Special Post, Sun and Tanning, Survey. You can follow any responses to this entry through the RSS 2.0 feed. You can skip to the end and leave a response. Pinging is currently not allowed.